I bloody love a match-three puzzler, and the tile-swapping variety is that rarest of things: a game mechanic born on a controller that actually benefits from a touch screen. Certainly that’s one reason there are so many on iOS. And very nice they are too. Increasingly though games are playing with the formula – games like Scurvy Scallywags. Its notoriety is not down to innovation though, more that it’s from the brain of Monkey Island creator Ron Gilbert. Which goes some way to explaining the convoluted set-up: the pirate theme comes courtesy of a theatrical production, with the game’s storyline switching between the real world of the theatre and pirate world of the play. It’s not as clever in execution as that might have made it sound. The dialogue – pirate sea shanties, the theatre manager fretting – is gently entertaining, but not enough fun to carry the game on its own. And what of the game? 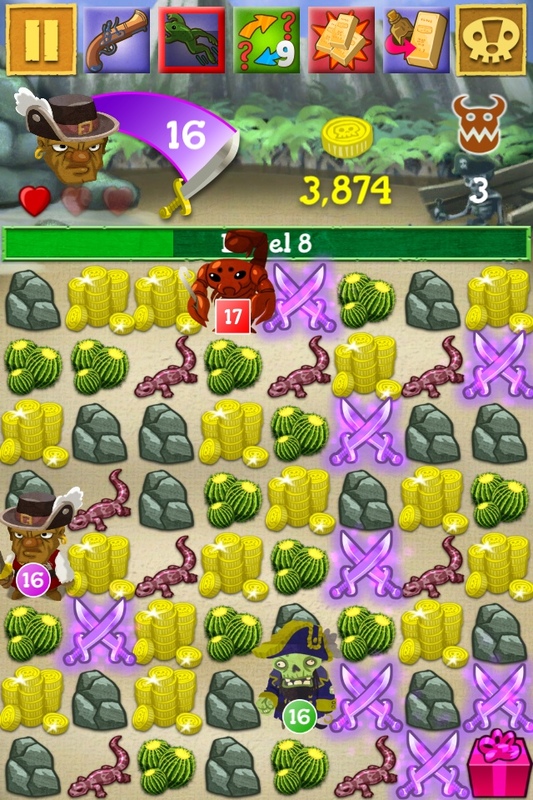 Your main task is to defeat enemies as they appear on the board. 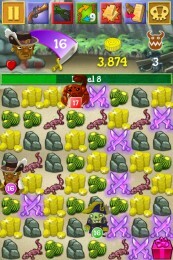 Matching swords increases your power, and once it’s above an enemy’s, you can defeat them by manoeuvring next to them. Fighting depletes your power though, so match more swords before encountering the next enemy, or you may die. Another little innovation is that the direction in which you swap pieces determines the direction from which new pieces will fill the screen. It’s a neat twist, though not as integral as it might have been had the challenge been stiffer: skills are effectively a get out of jail free card when you don’t think it through properly. Most tile-swapping match-three puzzlers descent into blind panic, frantically scanning the screen for another match to eke out the game that little bit longer, and push the score that little bit higher. With no time limit, this is a more considered affair; more and tougher enemies are, if anything, just an inconvenience. Still, it’s casually moreish, if not feverishly addictive. Which, you know, is nice enough.